Mindful Living Workshops at the Carlsbad public library,more info here. 2-1-1 San Diego - health and disaster services through a free, 24/7. BILY - Because I Love You - parent-to-parent solutions-oriented support group. CUSD, in conjunction with Interfaith Services, wrote and received a grant from Carlsbad Charitable Foundation to expand services from Interfaith to Carlsbad High School families. These services connect families of students facing multiple barriers to case managers on campus to meet basic needs through their Family Self Sufficiency Program. Barriers may include homelessness, foster care, struggling academic performance, behavioral concerns, health challenges or family issues. CUSD welcomes Brittany Krippner, Case Manager from Interfaith Services. The District Health and Wellness Council shall remain an active committee which will consist of students,parents/guardians, school food service professionals,District administrators, Board representatives, health professionals, members of the public, community services representatives and any other interested persons. The Council will meet throughout the school year to review the District’s Wellness Policy, Wellness Procedures, assessment results and new legal regulations. After review the Council will present to the Board any updates and recommendations as appropriate. The physical education and activity procedures will follow the Physical Education District Policy and Procedures. (CUSD BP 6142.7) Physical education and physical activity programs should be designed to foster and promote optimal physical fitness. 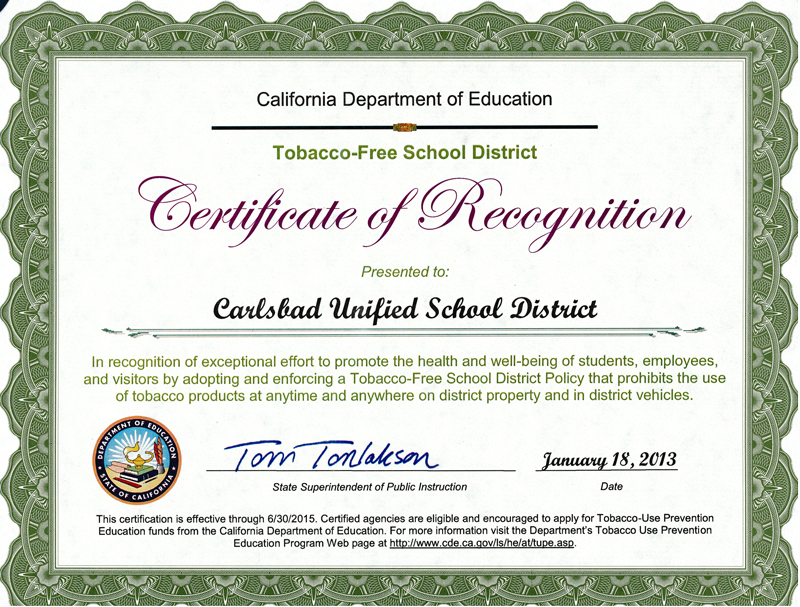 Nutritional standards for all food and beverages sold or served to students on campus will strictly adhere to all laws and regulations of the federal and state governments, as well as the Carlsbad Unified School District Wellness Policy. School lunches meet one-third of the Recommended Dietary Allowances (RDA) for protein, calcium, iron, vitamins A and C, and specific calorie levels by age group. Breakfasts meet one-fourth the RDA. To help with the Wellness Policy implementation, the Health and Wellness Council will facilitate a site by site review. The Superintendent or designee shall report to the Board at least every two years on the implementation of this policy and any other Board policies related to health, nutrition and physical activity. Each school shall post the district’s policies and regulations on nutrition and physical activity in public view within all school cafeterias or in other central eating areas.